Interested in learning the Guitar? 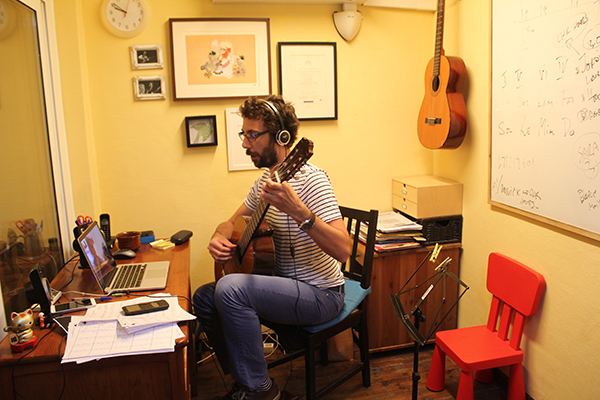 The Shine School of Guitar Barcelona is the first specialised guitar school in Barcelona to offer Intensive guitar courses and Extensive guitar courses in English, Spanish and Catalan online. Study with our professional teachers based in Spain. Contact us for more information about our Guitar classes. The Shine School of Guitar in Barcelona offers guitar classes with a qualified and experienced guitar teacher. The school provides quality guitar training for students of all ages and all levels. Teachers at our school can now provide you with the same classroom quality lessons in your own home via Skype, Google Hangout and Facetime. See our requirements page to see what you need and how to set up your space for your lesson. At the Shine School of Guitar the syllabus is hand-crafted based on each student’s needs, depending on the student’s level, age and the chosen style. Each student is an individual with distinct musical needs and preferences and and we recognise student’s individuality in all aspects of teaching. All Guitar Classes are private (one-on-one) and personalised within the syllabus of the chosen style to suit each individual student. “I play the violin for the public and the guitar for myself” – Paganini. The rich timbre of the guitar has captivated admirers for centuries. Few are those that did not dream to try their hand at playing the guitar. The guitar’s melodic and harmonic performance potential, as well as its propensity for fluidity of movement allows the performer a wide spectrum of possibility for expression. From its humble beginnings over 4000 years ago, through its various iterations over the milenia, all the way up until its current form, as the classical and later acoustic and electric guitar, has exploded into a global phenomenon. Today the guitar can be heard throughout all music genres in on every continent and in every culture.